11463. Wachholz, Ted, The Eastland Disaster Historical Society, The Chicago Historical Society. 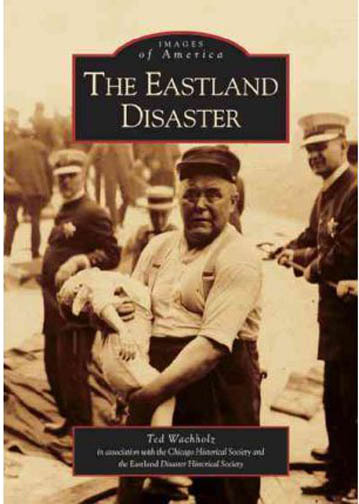 The Eastland Disaster. Arcadia. 2005. 128p. Soft wraps. 180 vintage photographs. More than 7,000 people living in the Chicago area and Michigan City, Indiana, eagerly anticipated Saturday morning, July 24, 1915. The fifth annual midsummer excursion and picnic had been organized by the employees of the Western Electric Company’s Hawthorne Works. Thousands of carefree merrymakers would enjoy a festive day including a lovely cruise across Lake Michigan to an awaiting parade and day-long picnic. For thousands of hard-working immigrant laborers and their families and friends, it was going to be a day to remember. Instead, the day’s scheduled event turned into a tragedy unlike any other. The SS Eastland, while still tied to the wharf, rolled into the Chicago River with more than 2,500 passengers on board. Nearly 850 people lost their lives, including 22 entire families. The ensuing struggle for survival, and the resulting death, heroism, cowardice, greed, and scandal gripped the city of Chicago. Thoroughly interesting and important account. (M). $21.99. 1585. (photo) U.S. Life-Saving Service Station, Evanston, Illinois c.1910. Wonderful early view of the one-of-a-kind station designed by J.L. Parkinson in 1876-77 with the crew posing with their beach apparatus on the ramp. 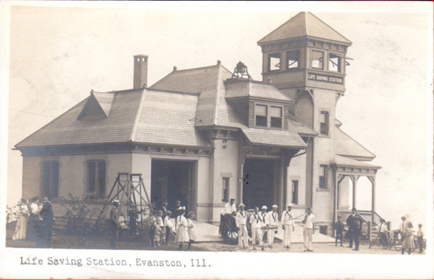 The U.S. Life Saving Station was located at Evanston , 12 miles north of Chicago , on Lake Michigan shore, on the Northwestern University Campus, and the crew, (excepting the Captain), was composed of students of the Northwestern University . The crew saved over 264 lives since their unit was established. Photo is overall quite clear and sharp and measure 3 ½” x 5 ½” on postcard paper. Great detail. (VG+). $74. 1404. 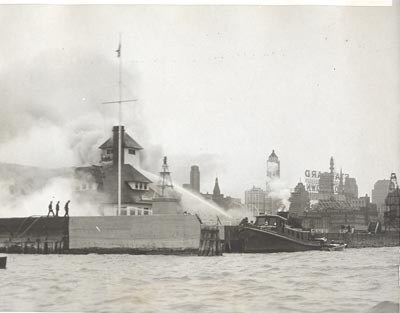 (photo) Old Chicago Coast Guard Station #280 On Fire c. 1933. Clear close press photo shows great detail as crews fight the fire in the Old Chicago Coast Guard Station at the mouth of the Chicago River. On Sunday, the 27th day of August 1933 at 7:30 p.m. Surfman Anton Drabik was on lookout duty at the Jackson Park Coast Guard Station. He reported that the Old Chicago Coast Guard Station was “On Fire!! !” The O.I.C. telephoned the station, however no one picked the phone. The crew launched their motor lifeboat right away and proceeded to the Old Chicago Coast Guard Station. They arrived there at 8:30 p.m. and assisted the Chicago firemen and the Chicago CG Station crew ferrying ladders, hoses and firemen across the Chicago River to the burning Coast Guard Station. T had started under the dock and suddenly burst forth to envelope one wall of the building. The interior and parts of the exterior of the Old Chicago Coast Guard Station were completely destroyed by the fire. The damage was so extensive the entire structure was torn down and rebuilt from the ground up. The only structure that survived the ragging inferno was the Boathouse. A new lifeboat station was completed in 1936. Measures 7” x 9”. Includes date and description on back. Dated August 27, 1933. (VG+). $56. 1344. (photo) Lighthouse Keeper Plowing Through Ice to the Station c.1936. 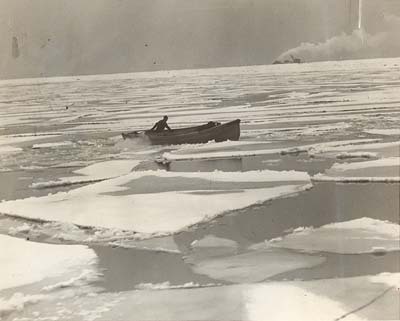 Clear, close, original 8” x 10” press photo shows good detail of the Lighthouse Service keeper plowing through ice in the small motor boat – probably enroute to Chicago Harbor Light. Photo is b/w and includes date and description on back. Dated January 8, 1936. Clear, close view, great detail. (VG+). $26. 6553q. United States Life-Saving Service. 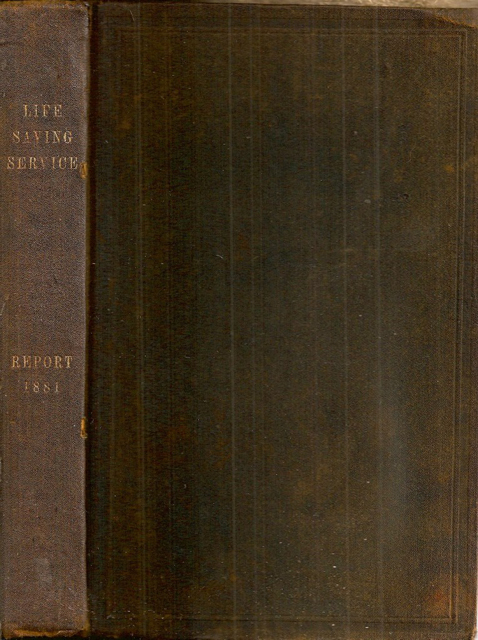 ANNUAL REPORT OF THE OPERATIONS OF THE UNITED STATES LIFE-SAVING SERVICE for the Fiscal Year Ending June 30, 1881. GPO. 1881. 428p. Typical govt. cloth binding. Includes extensive details of operations and of rescues throughout the year. Also details personnel, construction and repairs of stations and equipment, evaluation of new equipment and much more. Includes account of rescue by acclaimed light keeper Ida Lewis for which she was awarded the Gold Life-Saving Medal. Also includes 52 page report on Hunt’s Life-Saving Gun and projectile including test results, full page drawings, etc. 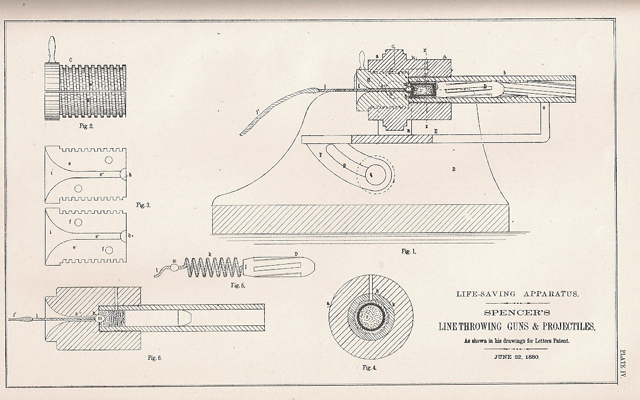 Also similar reports on Spencer’s line guns, and report with drawings on Life-Saving Service faking boxes, sponge covers, and more. Quite detailed, becoming exceptionally difficult to find. Expected wear, contents clean and tight save overall light browning from age. (VG-). $85. Also available the following years: 1879, 1880, 1882, 1884, 1886, 1888, 1889, 1890, 1891, 1892, 1893, 1897, 1901, 1904, 1906, 1907, 1908, 1911, 1912, 1913 (CG) 1920, 1921. Please inquire for other years. 2149. Karamanski, Theodore J. and Deane Tank Sr., MARITIME CHICAGO . 2000. 128p. 200 vintage photographs. Published as part of the Images of America series by Arcadia Publishing. 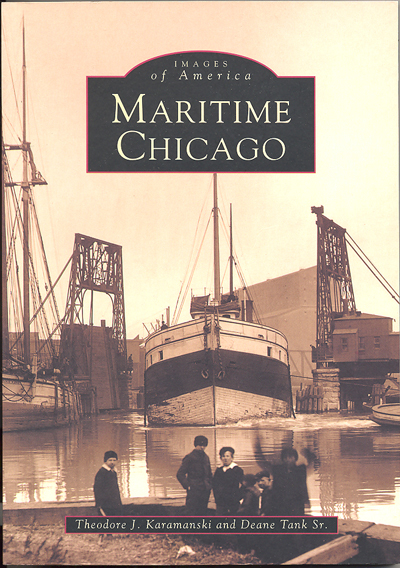 Provides a fine photographic history of maritime Chicago at the turn of the century including the lighthouses, lifesaving and Coast Guard stations. Heavy with shipping as expected, also includes Chicago ’s Navy, yachting shipwrecks and disasters and much more. This compact volume features over 200 early photographs dating from the 1870’s through the 1940’s, drawn mostly private collections, most never before published. and traces the history of these services through photos and text. (M). $21.99. 28452. 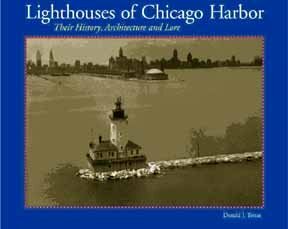 Terras, Donald J. Lighthouses of Chicago Harbor – Their History, Architecture and Lore. Evanston. 2006. 96p. Soft wraps. 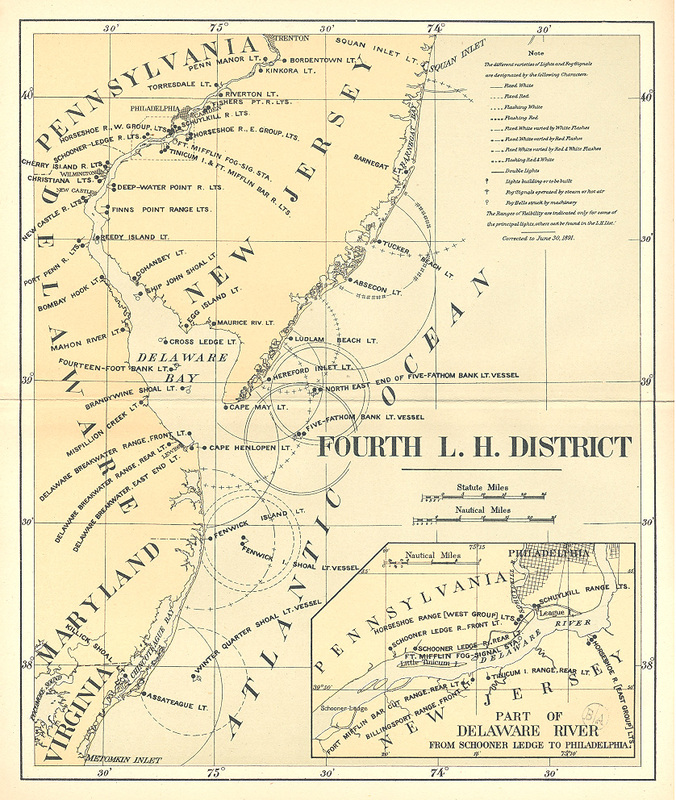 Since 1831 Chicago’s harbor has been home to a succession of lighthouses to grant safe access to one of the great historical port cities of the country. This beautifully illustrated book tells the story of the structures, the keepers, and the role that they played in Chicago’s development. Wonderfully illustrated with numerous vintage images, many beautifully reproduced in full page views. 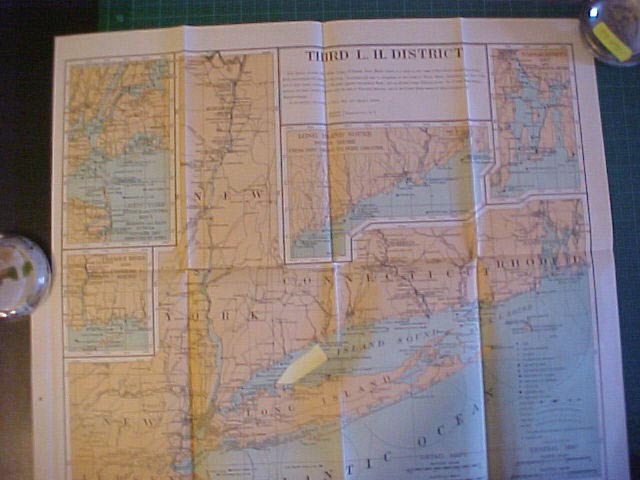 One of the first that you will encounter as you thumb through the pages is a full page color image of an 1848 Pleasonton map of Great Lakes lighthouses – a spectacular map by this early overseer of lighthouse construction in the United States. Other rare views include many keeper photos, lamps and equipment and much more. Well worth the price for these images alone. (M). $19.95. 11235. (photo) Chicago Harbor Lighthouse, Illinois c.1965. 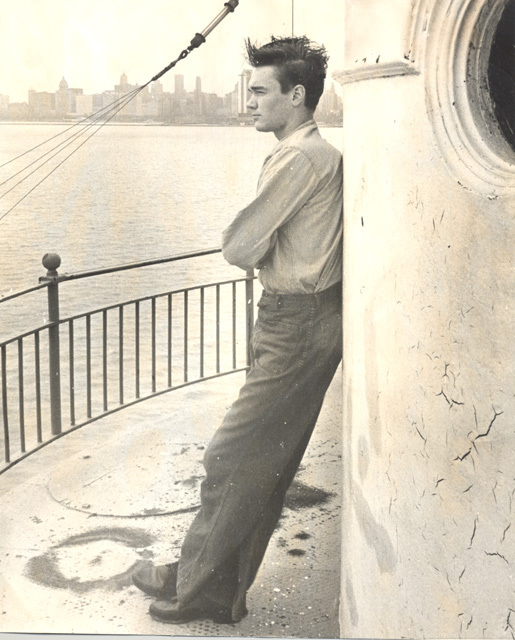 Close 8” x 11” press photo shows Seaman Pat Besemer spending a lonely vigil on New Year’s Eve on the gallery of the Chicago Harbor Lighthouse. Rare close view of the lighthouse gallery. With credit line and description on back. Dated December 31, 1965. (VG) $28.